Oftentimes, coming-of-age movies tend to embellish their tone and mannerisms, perhaps in hopes of holding younger viewers' attention with their catchy, larger-than-life presence. And it works: Diablo Cody's zinger-heavy lingo in Juno gave the Ellen Page-led pregnancy comedy its distinctive attitude, while the rapidity of dialogue and bold vulgarity of The Edge of Seventeen resonated with audiences. A consequence of that comedic exaggeration comes in the risk of losing the realism of the scenarios, and, along with that, the film's capacity to identify with people on a more meaningful level. Greta Gerwig may inject some distinctive quirk and personality into her own coming-of-age story, her sophomore directing effort Lady Bird, but she avoids the overdone style of her contemporaries while bringing to life a graduating high-schooler discovering herself under tricky circumstances. Instead, Gerwig blends cautious humor with a strong affinity for the realities of growing up, resulting in a charming yet expressive story about failed relationships, financial troubles, and complicated kinships with parents. Lady Bird takes place a decade and a half ago in 2002, right on the cusp of when the Internet transitioned from mainstream enjoyment to an integral part of society, which gives Gerwig's film both the stripped-down feel of lacking social media and the modernized attitude of the era. In an effort to claim her own identity, Christine (Saoirse Ronan) has adopted the name "Lady Bird", which she plans to take with her into senior year at a Catholic high school. She's an ordinary, creative girl who comes from a lower-income family, led by a mother (Laurie Metcalf) who consistently pulls long hours as a nurse, and she doesn't really have a plan for where she's going to college or how she's going to get in. Lady Bird follows the events of her senior year, in which she tries on different personalities, pursues new interests, and endures the rigors of romance, revealing how she copes with the complicated relationship with her mother and lands on the real identity of "Lady Bird" before she flies the coop. 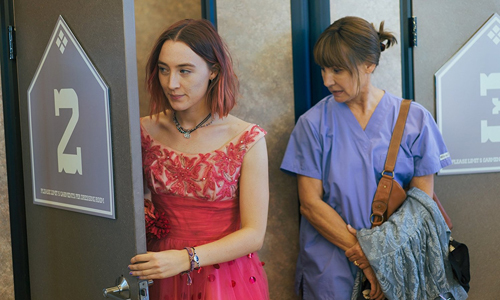 Despite there being a pink cast on the title character's arm that could suggest otherwise, one of Lady Bird's refreshing traits comes in how the storytelling doesn't rely on a specific device to move forward; no underaged pregnancy or grieving a deceased parent spurring the high-schooler's decisions or dictating stances. Her family's relative poverty ends up being the closest thing to that, and Greta Gerwig seems to understand that experience better than most, producing a script that emphasizes the nuances of a young, poor person attending school and figuring out their future amid other wealthy kids. There isn't a point of certainty anywhere in Lady Bird, nothing precise to expect as her experiences unfold, which allows those watching to truly appreciate the little details and benchmarks in her progression. Gerwig likes to include brief, seconds-long snippets showcasing moderately significant moments in her life, almost like flashes of memories playing out in her head. There's a delightful rhythm here, one that appreciates Lady Bird's stressors, delights, and how it all subtly shapes her into who she'll become. Nearly everybody has a story in Greta Gerwig's film, and they're not all directly impacted by Lady Bird's ascent into a graduate's mentality. Her family consists of Laurie Metcalf's loving yet controlling and undemonstrative mother, as well as her mathematician father (Tracy Letts) and her black-clothed, piercing-laden brother (and his wife), but they each have their own observable issues and existences outside of the youngest sibling's sphere of influence. The same goes from the students at her school, both her fluctuations in friends depending on her attitude in a given month and her romantic pursuits, all of whom experience their own degrees of growing-up tweaks -- both positive and negative -- throughout. Lady Bird doesn't hog the spotlight, and the film doesn't presume to think that the title character's the only one who's important. Gerwig's scripting and direction comprehends that everyone's important, both in how they impact Lady Bird and how she impacts them, and they can only do that if they're individuals as well, experiencing their own struggles and conquering their own obstacles. Of course, even with the versatility of the characters surrounding her, the rose-haired Lady Bird does remain the focus of Gerwig's film, boldly brought to life by dramatic powerhouse Saoirse Ronan. She's the embodiment of an early-2000s slightly alternative teen, someone who displays individuality in her appearance but clumsily tries to embrace it on a deeper level amid her family's money problems and the misadventures that stem from that, and the sharpness and subtleties of Ronan's performance allow those watching to get inside her head and experience how she's dealing with it. This isn't a big, brassy role for Ronan, one that instead develops an uptick of outbursts and frustrations that culminate in an impassioned, candid portrayal. The performances around Ronan create an effortlessly honest network of responses to Lady Bird's decision-making, but Laurie Metcalf's embodiment of mother Marion's stressed-out, authoritative control and underlying concern and care for her family is a masterclass in complexity, projecting just enough warmth for the audience to see but that others around her might overlook. Against a backdrop of classrooms, theater stages, and households both wealthy and not, writer/director Gerwig cultivates a sincere setting for Lady Bird's evolving circumstances, shot with candid intimacy by Frances Ha cinematographer Sam Levy, a frequent collaborator with Gerwig and Noah Baumbach. They've created a portrait of remembrances here, both small and large, that navigate well-woven themes of acceptance, reckless abandon, and adjustment of expectations within a convincing progression throughout her final year, as each of Lady Bird's experiences progressively shape her temperament and provide lessons for her to hold onto. While branded as a comedy of sorts, this isn't designed for the dialogue and situations to generate the kind of boisterous laughs that kitschy youthful banter and acts of brazen rebellion to authority tend to have in other stories of its type. Instead, the humor runs deeper, more private and meaningful in Gerwig's depiction as Lady Bird hits recognizable benchmarks in a tumultuous final year of high-school, and that's what allows her exemplary coming-of-age film to truly take flight.